If you feel intimidated when you visit the vet, let dog expert Wendy Nan Rees help you with some tips for preparing for a vet visit. It is sad to say, but our beloved dogs can and will get sick in their lifetime. Hopefully it will never be anything very serious. When it comes to taking our dogs to the vet, sometimes we can feel intimidated. If this is your case, here is a list of questions that you can feel comfortable asking your vet. I am a firm believer in being able to ask your vet questions. 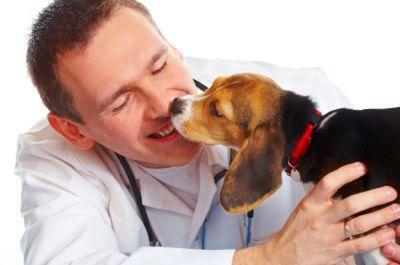 Having a solid relationship with your vet can help if, for example, he has to refer you for a second opinion. If you do not feel at home with your vet, then it is time to try talking with your vet by placing your cards on the table. If you feel you cannot even do this, then it is time for a new vet. If you are a first time dog owner and now looking for a vet, these questions will help you to pick the best vet for you and your dog. Remember, your lifestyle is also going to play a factor in picking the type of vet you personally need. Some like house calls and some like 24/7 services. All of these can be found by first talking with family and then friends, as they are always going to be your best source of information. Once you have a few recommendations from family and friends, be sure the front office and the vet speak a language you can understand. If the vet or the vet tech are using words that you cannot understand, it can be intimidating for anyone. You are not alone. Always write down all your dog's symptoms. Keep a diary of what is going on so you are able to give your vet a clear account of what your dog has been doing. Write down your own personal questions. This can be as many as you need to ask. If, for example, your dog is going to need surgery, you need to be able to understand what is going on. Remember, knowledge is power and it can take away much of your fear. Always feel free to ask your vet to slow down and really explain to you what is going on. It is a good idea to have medical insurance for your dog if your vet takes it. But if you should find yourself in a bind, try talking with your vet, as they want to keep you as a patient and they usually are willing to work with you. Do not feel bad if your financial situation is tight. This is OK. Most vets will be willing to work out a payment plan that you can afford. Ask to have a copy of your dog's medical records in case you need to get a second opinion, which your vet should be on board with. What should I do differently while at home with my dog? Does he or she need a special diet? What do I need to do to get my dog ready for surgery? How often do I give the medicine? What will the medicine do for my dog? How long should my dog be on medication? What happens if I miss a dose or two? These are just a few questions to ask. The best idea is to try to address the situation going on with your dog and create the questions to help you. The most important point I can make is, even when you do the best homework when looking for your vet, things can change. Your vet can go from being a small family practice to a larger group with 4 vets open 6 days a week. You may not get the same vet every time. Your dog is trusting you for his care and you are the one in control. If you are no longer happy with your vet, do not be afraid to find one who will make you and your dog feel at home and healthy.